The 1958 edition of the league welcomed an American entry -- the Williston Oilers, while Lloydminster and North Battleford decided to join forces as the Meridian-Beavers (although everyone called them the Combines). It would be another typically wacky season which featured a players' revolt in Regina and the subsequent collapse of the Regina and Moose Jaw teams. But, it also highlighted one of the finest players to touch bat to ball on the prairies. It was a summer dominated by future major leaguer Jerry Adair. The Williston shortstop (and sometimes pitcher) led the Oilers to the league title, beating the Combines in a best-of-nine final. Adair, who batted .438 for Oklahoma State in the spring, led the loop in hitting at .409*, tied for the lead in homers with 10, was tops in doubles, 16, runs, 65, and finished with 52 RBI -- one behind the leader. Also, he was the top fielding shortstop. On the hill, Adair made three starts -- all complete game victories. In the playoffs, he was even better. Adair hit .444 in 14 playoff games with four homers and six doubles. Right after the Williston victory in the finals (on Saturday, August 30th), Jerry Adair was signed to a major league contract by scout Eddie Robinson and flown to Baltimore. Adair made his major league debut on September 2nd. A pair of young lefties from USC -- Pat Gillick and Bruce Gardner -- would make their debuts with the Edmonton Eskimos. 15 players from USC suited up in the WCBL, nine with Williston (Bach, Barudoni, Blakeslee, Castanon, Guffey, Heath, Thom, Werhas, Conroy), five with Edmonton (Biasotti, Gabrielson, Gardner, Gillick (right), Satriano) and one with the Lloydminster/North Battleford Combines (McLane). The legendary Satchel Paige, as a member of the Cuban All-Stars, suited up for an exhibition against the Saskatoon Commodores. Williston wasn't built on hitting alone. Brilliant playoff pitching led the Oilers to ten victories and two ties in 14 post-season games. Bob Smith, 8-1 during the regular season, pitched four complete game playoff victories. And, Bill Thom (left) had three complete game wins and another where he went 10 2/3s before giving way to the bullpen. Thom tossed a five-hit shutout in the final game to give the Oilers the league title. He had led the University of Southern California to the College World Series in the Spring capturing the MVP award. He would be a first team All-American in 1959. The 1958 season had its memorable moments. 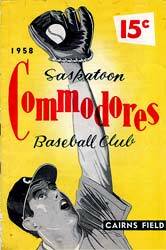 Late in the season, with Saskatoon trying to fight off both Lloydminster-North Battleford and Williston in the battle for first place, Gene Graves rose to the occasion, not only pitching the Commodores to a win, but throwing a no-hitter! Teammate Lew Hobson had quite a week in late July and early August. Over the space of seven days, the Canadian lefty picked up four wins. In a mid-June game, Jim Stevens of Moose Jaw fanned 18 to tie a league record. In the same game he walked 11. Later, Stevens tossed a one-hitter. There was also a 21-hitter. In late July, Frank Johnson gave up 21 hits but hung in all the way for Moose Jaw in a 13-2 loss to the Combines. On opening day, Jerry Adair set the stage for his outstanding summer with a grand slam homer. There wasn't much good fortune in Regina except on Friday the 13th when the Braves got three runs in the bottom of the ninth to steal a win. Déjà vu all over again. In back-to-back games in June, Saskatoon scored four runs in the ninth inning to come from behind to post wins over Williston. On consecutive nights in late July, Saskatoon overcame Williston leads to win with five in the 9th and seven in the 7th. Two days later, Commodores again scored in the 9th to beat the Oilers. Regina spotted the Combines a 5-0 lead then roared back to whip Lloydminster-North Battleford 18-6. The Braves also found out how the other half lives. On consecutive days they lost to the Oilers 20-8 and 20-6. After those two embarrassments, Regina owner Denny Evenson threatened to fine each player $10. It led to a revolt. Seven players packed up their gear and headed home. Bob Bodine of Williston had the lead in homers early in the year with five. He also had struck out 20 times in 40 at bats. Cliff Pemberton had quite a homecoming in Saskatoon. He returned to the city as playing-manager of the Mallards and promptly belted two homers, a double and a single, scored four runs and knocked in three as Moose Jaw upset the Commodores. Jerry Adair was the offensive story in the Western Canada Baseball League. Adair took the batting title with a .409* mark, well ahead of the runner-up, Leon Wilson of Lloydminster-North Battleford who finished at .371. Bill Heath of Williston has third at .370, Cliff Pemberton fourth with a .364 average, ahead of Higgie Alvarez (left) of Regina at .351, and John Ford of the Combines at .350. With Curly Williams (right) at .330, the Combines had three of the top ten hitters. Adair, Alvarez and Wilson (left) tied for the home run lead with ten. Wilson edged Adair 53-52 for the RBI title. Tom Bergeron of Lloydminster-North Battleford led in stolen bases, with 18. Saskatoon's Gene Graves, who pitched the only no-hitter, Bennie Griggs (right) of the Combines and Roland Jones of Regina each had nine wins to lead the circuit. Graves finished second to Williston's Bob Smith in earned run average. Smith was the league's best with a 2.72 mark while Graves finished at 3.06, ahead of the Oilers Jim Barudoni, at 3.12, Ralph Vold of Edmonton, at 3.14, and Lew Hobson of Saskatoon at 3.45. Griggs led the league in games, 19, games started, 13, innings pitched, 120 and strikeouts, 93. Roland Jones had the most complete games, 12, one more than Griggs. There were some familiar faces heading up the 1958 clubs. Ken Nelson (left), a veteran of prairie ball, took over the reins of the Combines (and kept intact a dubious Lloydminster record of having a new manager each season). Roy Taylor was back in the league, this time at the helm of the Saskatoon Commodores. Cliff Pemberton shifted from Saskatoon to Moose Jaw while Wayne Tucker returned to Edmonton and Zoonie McLean, a veteran of the ManDak League directed the Williston Oilers. Regina brought in veteran pro Bob Mistele to take charge of the Braves. Mistele was a victim of the unrest in Regina, and Roland Jones became the manager for the latter part of the season. The Southey Red Sox parlayed their success of last season into another championship by claiming the 1958 Southern League crown, the team's fourth such title in six campaigns. In winning the regular season laurels, the Scarlet Hose nosed out the pesky Notre Dame Hounds by only a scant half game. Facing each other in the playoff finals, the Redlegs again prevailed, taking out the Dogs three games to one with one game tied. Red Sox catcher Morris McNabb (left) was the circuit's top swatter, posting a .388 mark. Teammate Lionel Ruhr (middle) was second in the batting race with a .372 average. Ruhr was voted the league's MVP while righthanded chucker Phil Resch (right) of the Notre Dame Hounds took the top pitching award after winning eight and dropping three decisions. Granum's four-year run atop Alberta baseball came to a halt as the Medicine Hat Superiors took the Southern Alberta crown downing Lethbridge Warriors in the final series. Medicine Hat dropped the first two games of the final, then roared back to win four in a row to take the championship. Don Risinger drove in all eight Superiors' runs in the final game. In the major tournaments, Warriors won at Lacombe while the Superiors took top prize in the Lethbridge Rotary tournament. Former pro, Lynn Duncan (left) of Medicine Hat won the triple crown, leading the Southern Alberta loop in average with a .409 mark, in home runs with 17, and runs batted in, 63. Granum's Brack Bailey finished second in the batting race with a .378 mark. Sam Canner of Lethbridge had the most wins, 9. Tilbert Neal of Calgary pitched the most innings, 97 2/3s. Ron Hubbard (right) of Medicine Hat led in strikeouts with 119 and Doug Marquardt of Vauxhall topped the circuit in walks with 70. If you played for George Wesley, you signed HIS contract. A four-page, 1958 contract included this clause. The part about a player being prohibited from "drinking or partying" 24 hours before a game was replaced with a prohibition for the whole baseball season. "We want Bryson, Coggins, Bailey, Robertson and Eaton. Letter Follows. G H Wesley." There was a bit of a scare for college players. The National Collegiate Athletic Association began a clamp down on collegians in semi-pro leagues. A new code resulted in a few players (Jim Garrett of Fresno State, for one) sitting out the season. The NCAA announced in June that 35 teams had met the requirements of its code. Those teams included the Edmonton Eskimos and Medicine Hat Superiors. The code was designed to prevent collegians from losing their amateur status. It meant the players must have legitimate jobs, requiring a minimum of 32 hours a week and not be relying on baseball for their living. The rule did not apply to seniors or students from non-affiliated schools such as junior colleges. Not all the college players went on to become rocket scientists. Each of the players was asked to fill in a questionnaire. One of the questions attempted to delve into the player's activities in the off-season. The question read, "Position during the winter months?". A 1b-of for Lloydminster replied, "Any field or first base." In response to the question, "What do you consider your outstanding performance in baseball? ", another replied, "short stop". * The official league statistics did not include six games. Newspaper box scores have now been located for five of the games and the linescore for the last of the missing games. The additions resulted in some changes from the official figures -- Adair increased his league-leading average from .403 to .409. Leon Wilson took the RBI title, Higgie Alvarez moved into a tie for the home run lead, Bennie Griggs and Roland Jones tied Gene Graves for the most wins, Bill Thom dropped a few notches in the ERA race and, for some, it meant significant jumps -- John Ford of the Combines (who went 7-10 in two missing games) had his average jump to .350, and Bob Bodine of Williston moved up into nearly respectable territory, up to .198! As well, the league standings as shown in the official statistics, did not match actual game-by-game reports. The standings listed above are how the teams actually finished.